Miscellaneous. Watercolour signed H J Swanwick, undated and inscribed "TIGER". Captain H G Swanwick RN (d.1927) is better known for his agricultural paintings - shire horses ploughing, cottage and farmyard scenes, ducks on ponds, chickens scratching around in long grass - but he has given us here a painting of the battle cruiser HMS TIGER (Captain Henry Pelly MVO RN) in her very early days. 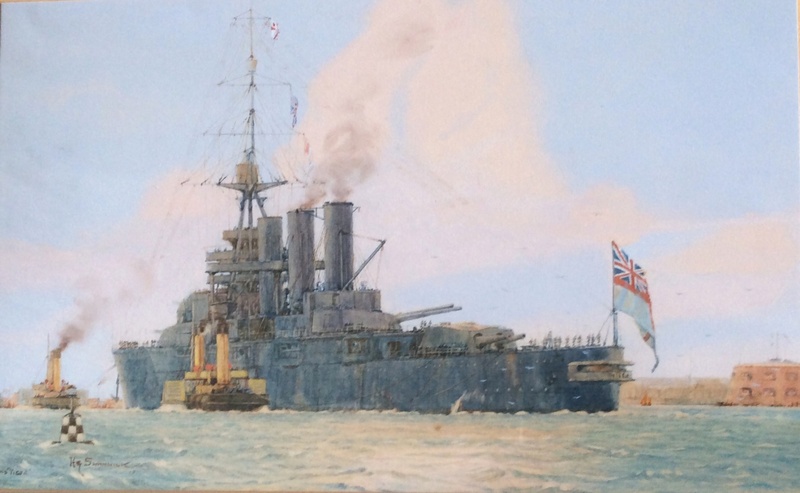 She was first completed in October 1914 and tellingly, her ensign staff had been shifted to the aft end of Q gundeck by mid 1915: her white ensign was no longer to fly from the stern - tripod and staff had been removed and re-located - until after the end of WW1 which enables us to date this painting reasonably accurately.